Made at the Mina-Jebel-Ali plant in Dubai, this lamp uses a Dysprosium-Thallium type recipe similar to Osram's HQI-(T) XXXW/D series of lamps. It is very unusual to see such a lamp from that part of the World. 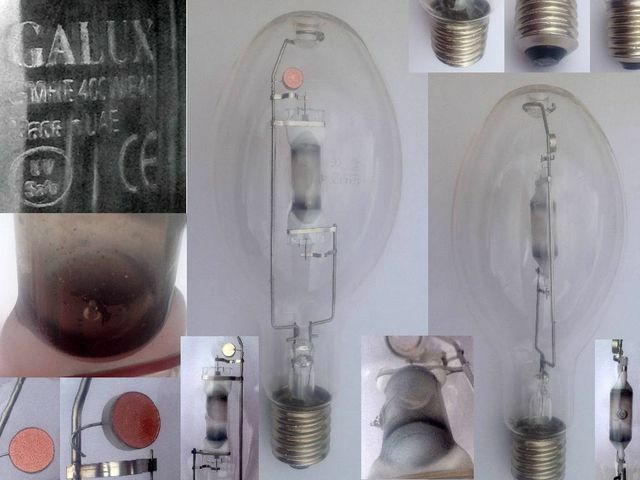 Gulf Advanced Lighting had, at one time, some sort of connection to Westinghouse who had developed a lamp with possibly similar chemistry..See US Patent 3452238. Yes, lamps from the Middle East, of any sort, are hard to come by. There ware plants in Beirut and Alexandria that were Philips run...but getting the lamps. There there was Tadiran in Israel. We had also incandescent lamps made by DJG Industries during the 90's. What happened to those two Tadiran lamps in that Hospital store room dor? Give you a hundred bucks each for them! Then you can buy a spectroscope! Go up and ask them dor...the worst they can do is tell you to "go away"! This was long time ago, so it is irrelevant. Never led a lead to (a) rare lamp(s) "rot away" dor....generally you see (a) rare lamp(s), you ask and you grab right there and then. If for some reason you miss...it is still worth the long shot...go and ask...then you will KNOW if they were chucked, of if they are still in the system somewhere (but not wanted). I really thought you would have been aware of the end of chemical photography...and they obviously were. 1: Geez...everybody is using digital cameras now! 2: I hasve seen a lot of film camreas in the rubbish or on sale very cheaply...I wonder why they are so cheap now? 3: Gosh...it is so easy to store thousands of photographs on a hard disk! 5: Oh, but up at the hospital they are still developing wet chemical X-Ray film....surely they are aware that digital exists now is is far better, faster and cheaper. (YES! the are/were!) BUT they needed to buy that one expensive scintilation imager to make it all work! 6: Geez, I remember I saw some Tadiran lamps in the store room with all the chemical photographic supplies! 7: Didn't I hear somewhere that Tadiran closed their plant 5 years ago and moved all production to China! 9: I seem to be the only one around here who is aware of all this...I BETTER DO SOMETHING about it! 10: I better ask someone up in the X-Ray department WHO the person is that has the authority to dispose of stuff and I should go to and ask that person in authority for permission to take those Tadirans, because it is obvious from the impending situation that they DON'T WANT THEM ANYMORE!!!! 11: So that means I can rescue them from destruction and have an example of something my country proudly made rather than getting the Chinese to do it! You have the picture you took of them, take it up there and "ask around"..."have you seen these? They were in room XYZ five years ago...do you know where they are now?" "No I don't but go and ask Gideion X in room ABC, he knows all the stuff that goes on around here..."
Dor, I have tracked some rare lamps that are now in my collection for 30 years...this CP/14, I "shadowed" for 33 years...from 1982 to 2015...I watched it, went and spoke to the people who had it about once every six months, asked them if that still used it, made sure they knew I was interested in it...in the end, I got it...it did not slip through my fingers like sand!